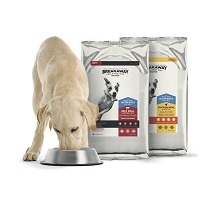 Request a free Texas Mills Breakaway Kibble & Freeze Dried dog food sample by mail. Breakaway uses a single source freeze-dried raw kibble for better tolerance of protein allergies. The kibble is made to maximize both palatability and digestibility. Would love a sample to see if my elder furbaby will eat it. Trying to find something healthy for her digestive.